What would you do to get out of eating your vegetables? 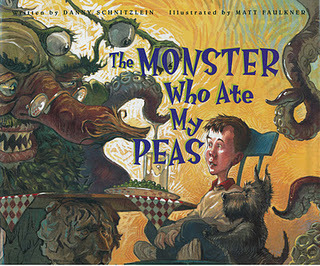 The young boy in The Monster Who Ate My Peas would do just about anything. When a monster, who looks like a cross between an octopus and an organic waste pile, shows up and drives a hard bargain, the boy loses his soccer ball, and then his new bike in exchange for the monster eating his peas. The boy comes to regret his choices when his friends stop inviting him to ride bikes with them. He swallows his pride, I mean peas, and fights off the roaming tentacles of the monster to save his most prized possession and makes a surprise discovery as well. The whimsical verse flows well with the outrageously fun illustrations, making this a must read for any child who hates his greens. My twelve-year-old son read this and laughed out loud. When he was finished he said, "Oh my gosh, this boy is so stupid." It's not very often I get such a strong reaction from a boy who thinks he has outgrown picture books, but loved this one. Ages 5 and up. Highly recommended. **Disclaimer: I have received a free book from the publisher for review purposes. I have not received monetary compensation. My opinions are in no way influenced by the publisher nor has the publisher asked for a positive review. CONTEST DETAILS: Contest is sponsored by the publisher and the book will be shipped by them. Please follow instructions on the Rafflecopter form to enter. Contest ends Sunday, November 13 at 10:00 MST. Winner will be notified by email and have 48 hours to respond or a new winner will be chosen. You must click on the blog title to get the rafflecopter form to load properly. Monster by Coretta Scott King is my favorite. My favorite is Frank Was a Monster Who Wanted to Dance by Keith Graves! The Beast in the Bathtub. Idk if he fits the definition of monster but its a favorite in my house!! We just got Zombie in Love which is super cute! Not really a Monster but I love "I was So Mad". I can remember reading this book over and over to my youngest son and when my youngest grandson was born we bought another one for him and we read it all of the time. We also love Where the Wild Things Are. My favorite monster book is Where the Wild Things Are! My favorite Monster book is Where the Wild Things Are. The Terrible Monster is one of my favorites! Where The Wild Things Are is my favorite. My Monster Mama Loves Me So and Where The wild Things are! Thanks for the giveaway! Hands down Where the Wild Things Are!